We are proud to have lit the LG Eco-City garden designed by Hay-Joung Hwang at Chelsea Flower Show 2018. 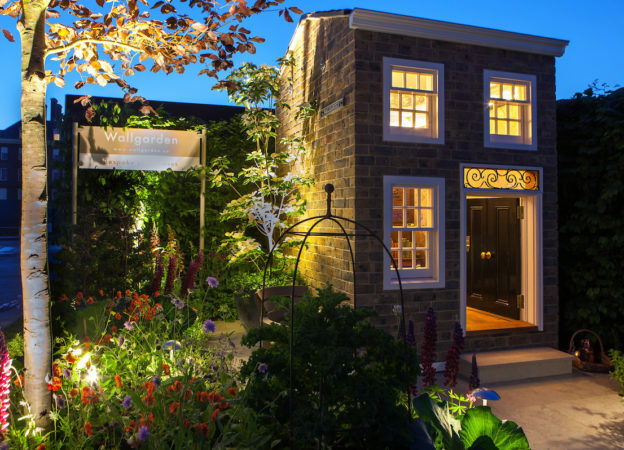 The lighting scheme, designed by our Creative Director Sally Storey, brings together both inside and out picking out the key features through-out. 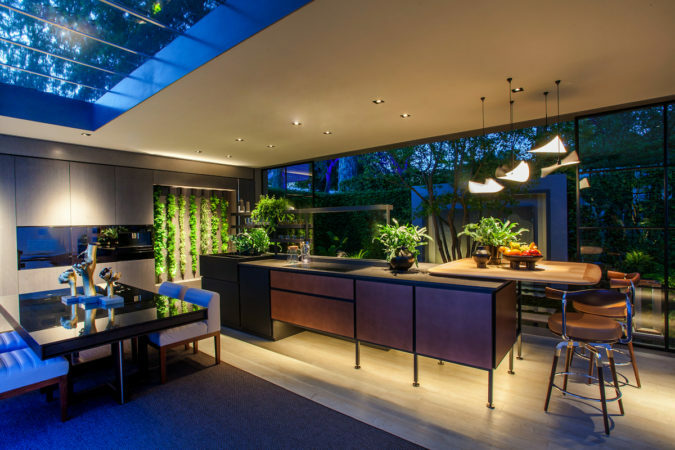 Sally selected the following products to bring the garden to life at night: The path to the outdoor seating area and kitchen beyond is lit with Guida floor washers guiding you through the space. The architectural nature of the trees and sculptures are emphasised with spiked Kensington spotlights. A soft glow is created under the seating area with Contour HDX27 creating an oasis of calm in the space. The back garden is lit with spiked 1w Kew spotlights. Inside the kitchen, Square Trimless downlights light up the work surfaces and provide general ambient light to the space. 1w Lucca uplights light up the living wall and the slatted walls. Contour HD27 is used under the kitchen lighting to create a soft floating effect. Designer Hay-Joung Hwang’s garden provides a prototype for sustainable city living. It integrates our increased dependency on technology with a requirement to be mindful of the environmental issues posed by contemporary lifestyles, as well as to reduce pollution specifically in areas of high population density. The plants and trees play a role in the seasonal control of oxygen generation, humidity control, temperature moderation and the reduction of carbon dioxide. We also had the pleasure to light the Wallgarden stand. 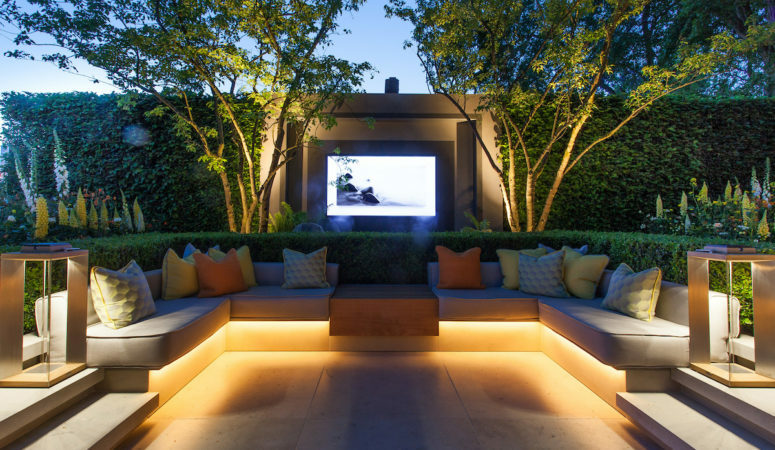 This playhouse features our Luccini uplighting the fireplace, Contour HD24 providing moody high-level lighting and Portobello magically illuminating low-level planting. 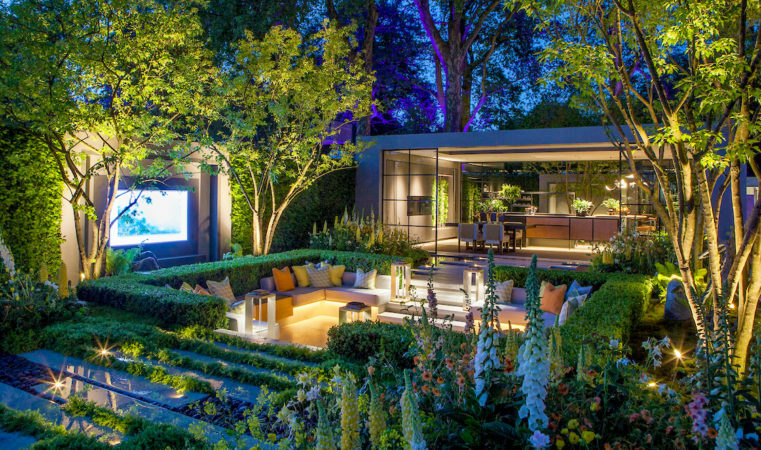 Wallgarden collaborated with multi-award winning designer and landscape architect Sarah Eberle for an exciting new addition to the 2018 RHS Chelsea Flower Show.